Our Fall Carnival was a huge success and it's all because of the help I received. I couldn't have done it without you. Some of you gave money, some of you donated gifts, some of you ran errands, and some of you donated your time and talents. I cannot thank you enough for all your help. Because of your help, we were able to raise lots of money that will benefit our school and our children at the academy. Our booth was given the decade of 1910s. Raggedy Ann was introduced to the world in that decade. Our class made Raggedy Anns out of paper plates and yarn and was used to decorate one side of the booth. We created a huge sinking Titanic and our boys were put in the water in lifejackets. They had so much fun posing for this one! And our girls were put in typical dresses from that decade and were protesting in the streets for "Equal Pay" and "The right to vote". Women's Suffrage really heated up in that decade just before we won our right to vote in 1920. 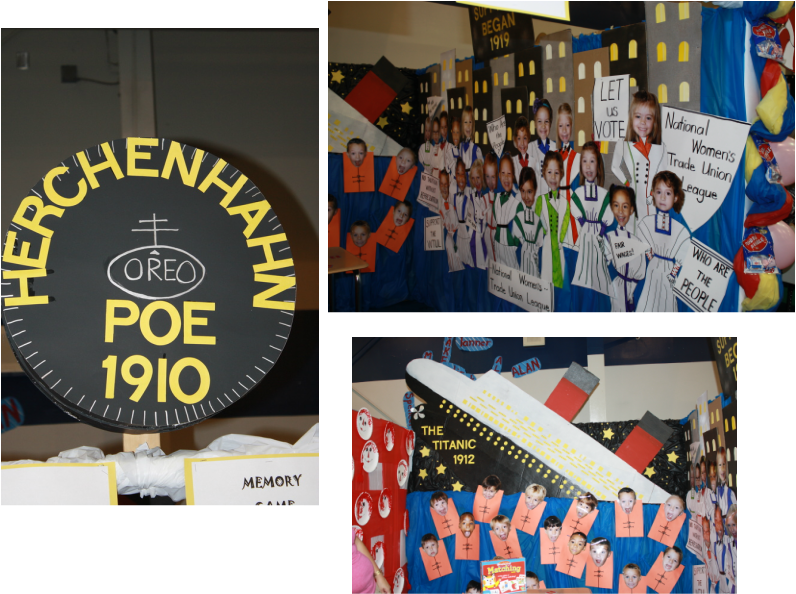 And last, but not least, the Oreo Cookie was introduced to the world in 1912, so our booth title was made from a giant Oreo. In addition to the money that was raised for the school, our booth ended up winning SECOND PLACE and a $25 gift that Mrs. Poe's class and I split. I took our share and purchased some new books for our class library! So, thanks again for all those who gave to make this year's carnival a success! !